All whey protein is not created equal. I have developed my reputation of developing the highest quality supplements in the industry and not cutting any corners in the development of nutritional supplements. Originally, I did research and development in the ocular nutritional industry and found if we made the eyes healthier through proper nutrition we actually also improved overall health. This led me into developing supplements for total body health that ultimately helps the eyes as well. I have found after working with patients for nearly 25 years that the vast majority are not getting good quality protein during the day especially for breakfast. I started recommending whey protein supplementation many years ago to my patients and found that a really good quality protein with a decent concentration was hard to find for an affordable price. I started researching different types of protein and very quickly determined whey protein was the best form for my patients. However most whey protein comes from cows that are gmo grain fed ,filled with pesticides, antibiotics, synthetic sweeteners, binders,hormones and have been overly processed. After extensive research I wanted a whey protein that came from cows that feed on pesticide free grass all year round and are not given antibiotics or hormones of any type. I also elected to use a whey protein concentrate instead of a whey protein isolate. The whey concentrate is the least processed form of whey protein that has not been stripped of the good fats, immuglobulins minerals and enzymes. I do not like Whey protein isolates because when you remove the fat you also loose much of the valuable anti aging and immune building aspects of the whey protein. I also elected to use a non denatured whey protein concentrate to maintain the natural quality of the whey protein the way mother nature made it. Non Denatured whey protein has the highest biological value of any protein. While involved in R&D of supplements for macular degeneration I found a large percentage of patients were deficient in Glutathione our “Master Antioxidant” responsible for many aspects of good health. I found with my patients one of the best ways to stimulate glutathione is by consuming a non denatured whey protein concentrate daily. When protein is heated or denatured it converts covalent bonded cysteine to cystine a much less biologically active form of the amino acid. Covalent bonded cysteine is the most important amino acid responsible for the production of glutathione. Glutathione is crucial at all ages for a strong immune system. Lastly I decided to use New Zealand Grass fed A2 cows as the source for Fortifeye Super Protein because these cows met all of the criteria I required for the perfect protein I can stand behind and trust. A2 cows milk have not gone through a genetic mutation that alters the protein causing digestive issues and other potential health problems associated with A1 cows milk. I worked for some time on a natural organic flavor system combined with non gmo sunflower seed lecithin to make both the vanilla and chocolate flavors delicious and creamy. 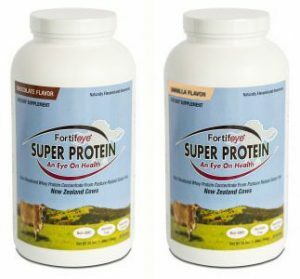 Fortifeye Super Protein was developed so doctors and consumers now have the highest quality protein supplement available at a reasonable price.